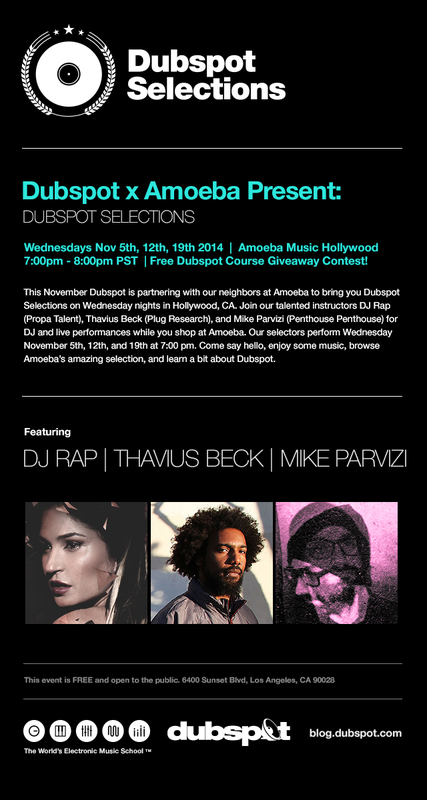 Join us every Wednesday in November for live performances and giveaways during Dubspot Selections at Amoeba LA featuring DJ Rap (Propa Talent), Thavius Beck (Plug Research), and Mike Parvizi (Penthouse Penthouse). This November Dubspot LA will partner with our neighbors at Amoeba Music to bring you Dubspot Selections on Wednesday nights at 7pm in Hollywood, CA. Join our talented instructors DJ Rap (Propa Talent), Thavius Beck (Plug Research), and Mike Parvizi (Penthouse Penthouse) for DJ and live performances while you shop at Amoeba. Our selectors perform Wednesday November 5th, 12th, and 19th at 7:00 pm. Come say hello, enjoy some music, browse Amoeba’s amazing selection, and learn a bit about Dubspot. Charissa Saverio, a.k.a. DJ RAP, is an undisputed queen of the turntables who has been voted the number one female DJ in the world. She’s a global ambassador for electronic music culture and she has collaborated with artists such as BT, Eric Morrillo, Hans Zimmer, Hybid, and DJ Tydi. DJ Rap is also a classically trained pianist and songwriter who runs two record labels (Propa Talent, Impropa Talent) and has produced numerous chart-topping releases. She has also produced music for video games, commercials, and numerous other films. DJ Rap is multi-talented, accomplished, ambitious, and driven by her passion to create and her love for music. Thavius Beck is an electronic musician / producer / programmer as well as an Ableton Certified Trainer who has worked with artists ranging from Nine Inch Nails to Saul Williams to singer/songwriter Skylar Grey. He is currently signed to LA-based label Plug Research, who released his most recent solo album, The Most Beautiful Ugly. 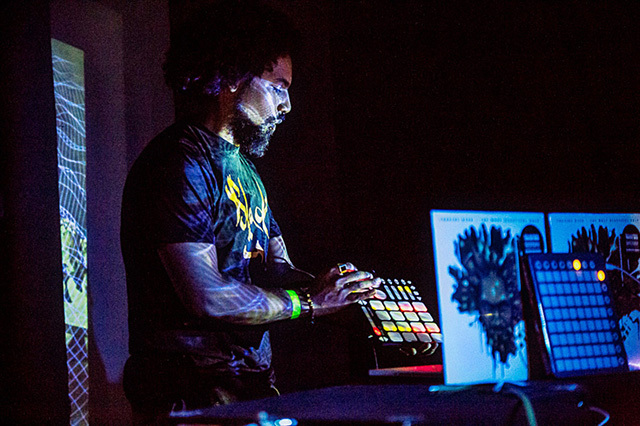 In addition to creating and performing his own music, Thavius has held electronic music workshops in multiple countries, regularly gives one-on-one tutorials to private students and artists on Ableton Live. He has also worked closely with companies such as Novation and Keith McMillen Instruments doing product demonstrations, dealer trainings, beta testing, and showcasing the gear that he is most passionate about. Thavius also developed half the video content for Dubspot’s new Ableton Live 9 online course. 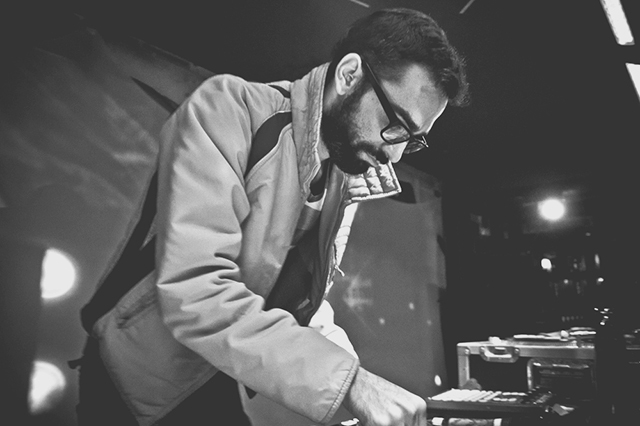 Mike Parvizi is a music producer and multi-instrumentalist based out of Los Angeles. He is a co-founder of LA collective TeamSupreme, and 1/2 of the production duo Penthouse Penthouse, who recently completed a national tour with The Glitch Mob, opening shows to sold out crowds. Penthouse Penthouse also performed at the 2014 Coachella Valley Music Festival. Mike also teaches Ableton and Music Foundations courses at Dubspot LA. Make sure to check out Mike’s latest work as part of Penthouse Penthouse who recently released the Besides EP, available on bandcamp. You can also check out their music on their Soundcloud.